This photo was taken on 12/10/17 at 4:21 PM. The location was in my home in Bethesda, Maryland. The "Take It!" came from having rescued this likeness of a wren sitting on a nest imbedded in a scrap of Walnut wood which was in the pile of wood destined to go into the shop wood burning stove of the fellow that does excellent wood working for me. There was no hesitation on my part in the recognizing of this bird. The big eye adds to the novelty of the piece. 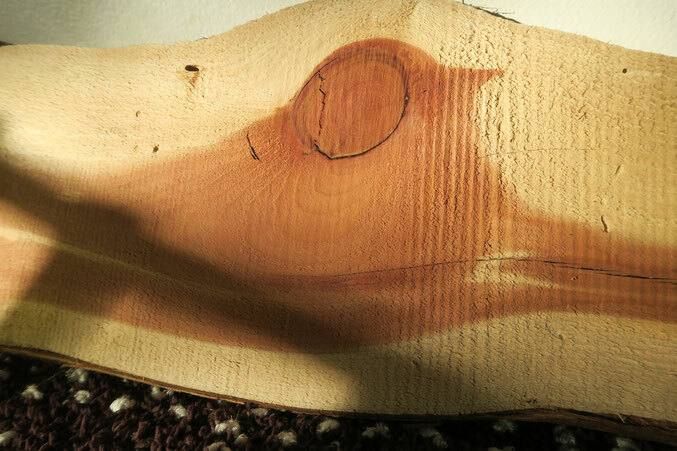 The After Take: To all I have shown this scrap of wood - not a single person has had any difficulty in imagining the bird likeness. This picture is a delightful addition to the collection I am gathering of images in wood, which I someday hope to put into a book format. In the meantime - I hope you enjoy the picture as much as I do. My daughter loved this one. She went on and on about all the colors she could color it. First thing I thought before reading the title or anything you wrote was Wow that looks like a bird on a branch or something. Then I noticed that is exactly what you saw lol. I love these types of photos that you do, they are so fun to look at. It really does look like a bird. You’re pretty good at finding these things. Hi Jim: Thank you for your high mark complement. I sometimes have to grapple with an image or subject, but this one seemed to almost name itself, and in so doing speak to me on its selection. It is instances like this one, that confirms my intermediary status. I, with appreciation put your star of lauding up on the chart. Hi Sally: Thank you for passing along the reaction from your daughter. It is somehow easy to see how she was able to respond - it has something to do with the quote about the apple not falling far from the tree. From everything I can gather, you and Jim are offering your children lots of encouragement to be creative, which is a wonderful gift to them. The payback for this sometimes effortless ( for some ) investment is many fold. Thanks again for including us in the folds. Hi SF1967: Thank you for sharing your initial reaction to viewing the Wren. That it was so in sync with my own observation was a tribute to that voice that has some things speaking for themselves, and us being listeners to them. This having been said, it is a pleasure to be in the audience with you. Thanks again for being so ready/willing to speak out to us. Hi MHampy: Thank you for your gracious complement. You have fully caught the spirit of my motivation for most of my work. I have to say, that sometimes it may not start out exactly as fun, but I do what I can to bring it there when/how ever I possibly can. You have my pledge to continue in the attempt to share more of the same. Hi Gabe: Thank you for your complement. While I can honestly say I am on the look out for subjects - I have to happily confess that some of them seem to almost jump out at me. A condition I gratefully accept, and am pleased to pass along. Hi to That one Guy : Thanks for your recomendation for the site to your Mother. I hope she enjoys the ' Wren '. I have a product that I have been working on for some time, that keeps changing for the better as I proceed, that is bird centered. I never knew I could get caught up in such a thing, but here I am, and I must say, enjoying myself immensely. I can only hope at this point that others will like it as well. Please stay tuned. Thanks again.